Another sojourn into New West. I’ve been expanding my food hunting journeys to the “far east”, as frankly for me its a largely unexplored area and the Vancouver coverage of eateries and restaurants is seemingly getting more saturated and repetitive – especially in light of the start of “the event” next week in town. So I thought, what a better way to really get off the beaten path of reviews on those standard superstar places that are appearing in cyberspace and print media, than a return to a classic mom-and-pop joint. Interestingly enough, despite its very generic sounding name, Burger Burger gets top billing on the commercial signage that stands at this complex along sixth street. It totally reminded me of my high school years, where my buddies and I would always congregate at our town’s favourite hole-in-the-wall burger spot – which ironically stood across the street from a McDonald’s. Even the yellow signage was identical, as well as the open facing flat top cooking area and fantastically priced burger-fries-drink combos. Over a decade later, I am bewildered to see that a place like Burger Burger has prices that I am most familiar with when I was a cash-starved but always hungry teenager over a decade ago. On the quick and easy breakfast trail in New Westminster, I chanced upon Mon Mom’s Cafe located along 12st Street. Situated in a wooden building reminiscent of structures popular from an earlier era, it certainly has its charms and nostalgic sidewalk appeal. The slow pace of things on the road outside took a turn as I stepped inside the place which was full of chatter and customers. The sounds and smells of a breakfast diner never fail to disappoint me. With breakfast plate offerings (eggs, toast, ham/sausage, French toast/pancakes) in the $4 to $4.75 range, and omelets in the $5 to $6 range, great value can be had. Preferring French toast over pancakes, I ordered one of the choices from the top half of the menu and sat back to take in the scene. Families, groups of working class men, single diners taking up the smaller tables near the front window, it was all a regular mix of common folk out for a relaxing morning meal. Located in a dilapidated building along Edmonds Street, very close to the new Burnaby Public Library, is this quaint space known as Lhy Thai, that served as a quick fix for me recently. Inside, the dining quarters are cramped to say the least and you won’t be coming here for the decor. Coupled with the widely unnecessary array of low quality posters that could easily be mistaken for being ripped out of some promotional material for Tourism Thailand encased in cheap frames all over the walls, and the stacks of books near the bar enclosure, and the place feels even more claustrophobic. Where I was seated, I had a decent view into the kitchen area, which I noted was staffed by all female, Thai-speaking cooks. The delectable intricacies of the mouth watering cuisine from the Kingdom of Thailand – a country that I’ve had the pleasure of visiting at least ten times in my lifetime – sadly gets undue respect here in North America. Perhaps its the fear of the “exotic-ness” that many people associate with the food from this southeast Asia nation, or the complexity of sweet, savory, spicy, sour and bitter that permeates so many of its fine dishes that is confusing to locals more accustomed to meat and potatoes, which results in a “let’s dumb it down” approach that native-Thai proprietors are forced to take in order to survive and try to establish a beachhead for their cooking in a foreign land. On a busy strip of West Broadway populated by many local shops and restaurants, I was completely shocked to see the signage for Thai Terrace while driving past in the early evening and in the middle of a downpour. I traverse this section of Vancouver often and it surprised me that I had not seen this place before. With a few diners already inside eating and a couple waiting at the til (apparently to order to go), I decided to turn my car around and stepped inside. Located on the second floor of mixed commercial/residential complex just behind University Village at UBC, One More Sushi is impossible to see from the road. With three other places (Suga Sushi, Osaka Sushi, Omio Japanese Restaurant) in the same general area that also serve up their take on sushi, it makes for a very condensed location for Japanese food. As such, unless you knew about it from actually walking in the area, I highly doubt you ever knew it exists and most people probably satisfy their sushi fix at one of the other better known and more visible places. As it occupies a more spacious area, the seating floorspace is clearly the largest of the sushi serving restaurants in this geographical area. A long narrow entranceway leads into this space, with the sushi bar along one side that leads back to the kitchen area, as well as a bar station that is located nearby as well. As the lighting was incredibly dark, and we were seated at the opposite end, I could not be sure but it appeared like there were private rooms at the other side of the room. The decor was your typical, North American interpretation of what a Japanese restaurant “should look like”, with cheap pictures and paintings hanging on the walls. One more thing I would mention is that the heating, or lack there of, made the place very cold – something that people who have gone there on multiple occassions have told me never changes. So dress warmly! 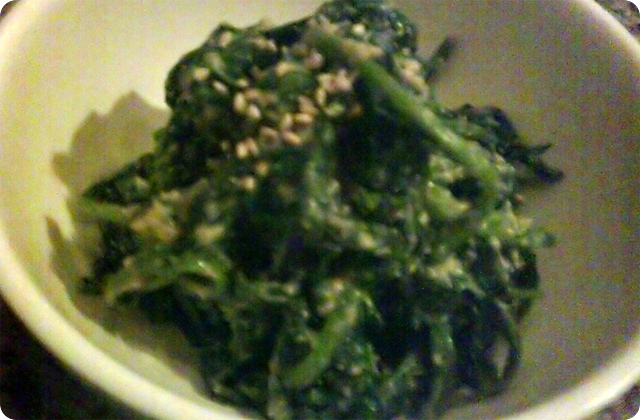 In the mood just to share a few appetizers and get a sample of their sushi, our table chose a basic spinach Gomae, which had a weak flavored but really thick consistency to their sesame paste/dressing. Not the good first food impression we were hoping for. 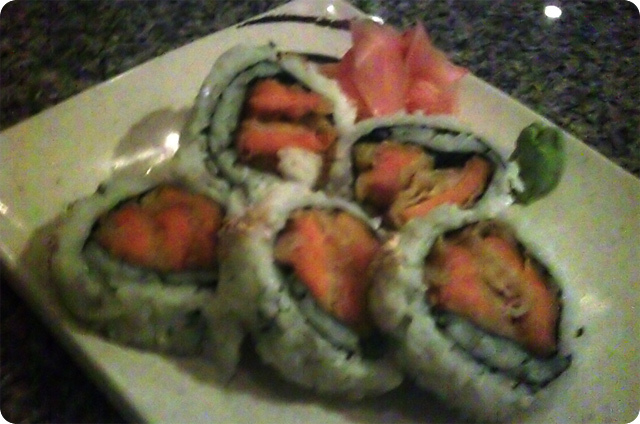 This was followed by a serving of the Agedashi Tofu. 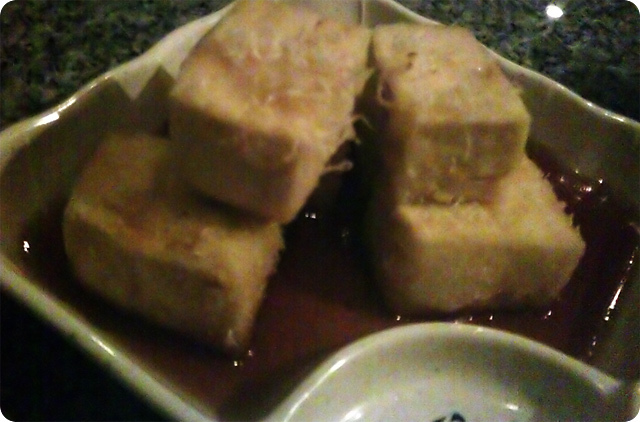 It had a very thin layer of coating and the tofu itself was fresh and very soft. Perhaps they could have fried it a bit longer and provided a more flavorful broth to accompany it. Two appetizers in, and I was disappointed at how lighthanded they were with the depth of flavor in both. 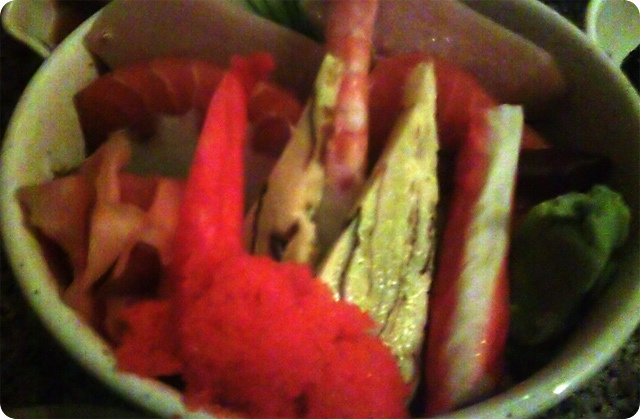 Lastly, as I was somewhat hesitant to try any nigiri, I elected to go with the Chirashidon. That way I could at least try to get a semblance of the quality of their product, freshness and skill in cutting. It came in a rather smallish bowl which was fine as too many places put this in a large one and compensate by filling it with too much sushi rice. It turned out the ingredients themselves were simply average – not horrifically bad that I couldn’t eat it, but not overly enthusiastic at the same time either. Recently, one of the movies in the X-Men trilogy was broadcast on local television. It reminded me of that age-old question that seems to pop up whenever a superhero-action movie is played. If you could be blessed with super human powers of any kind, what would you want it to be? To make matters slightly more interesting, let’s see how that might tie into food or eating out. For me, if I had the choice, I’d really just go for a basic Superman package. Being able to fly super fast where and whenever I wanted, is all I would really desire. Perhaps its from my many years of tedious air flights to international destinations that makes me wish I had my own personal form of ultra quick, long distance transportation. If I felt like having Italian food, I could jet over to Rome in minutes and not have to head over to the nearest restaurant facsimile here in Canada. Fresh sushi? No problem. In minutes I could be back at my favorite Ginza sushi bar. Could you imagine the possibilities? Dining out would be taken to an entirely different level. But being as I don’t hold such abilities of lightning fast flight, I had to make due with regular modes of transport on a day’s journey that took me through three border checkpoints and resulted in a total of six immigration stamps and one visa applied for. Beginning in Hong Kong, we took a TurboJET across water to the port of Macau, spent a few hours exploring around, walked across to a land border station to enter mainland China, shopped and ate, walked back across to Macau, and then the speed boat back to Hong Kong. 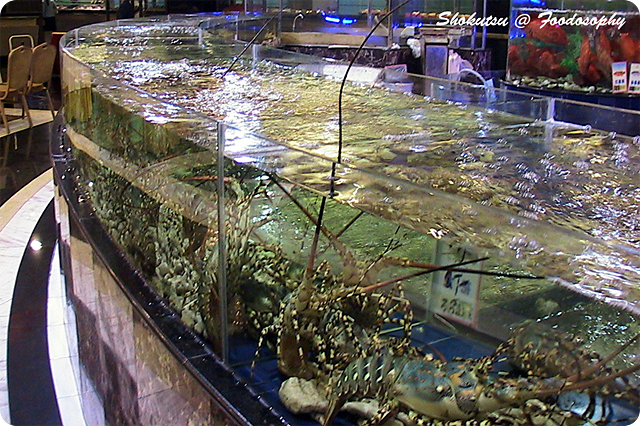 My Hong Kong-residing friends kept telling me that if I wanted large quantities of fantastic seafood for absurdly cheap prices, then we needed to go to the mainland. They said it would save us a bundle and we could see other sights as well. Me, not being a hard sell, jumped at their idea and off we went. 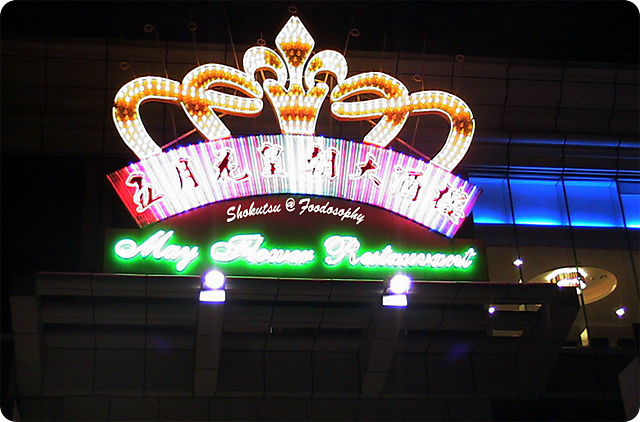 Their suggestion, the May Flower Restaurant was apparently well known, but finding it, that was another challenge. Trying to navigate around a strange town in China after the sun had set is something that I will not attempt ever again. For after a nightmarish taxi ride which felt like I was in the midst of a video game with all the swerving and ignoring of traffic lanes and even lights(! ), and getting ripped off on the change (the sneaky driver folded two bills to make it look like four notes – hey, I know its a small piece of change but its the principal, or rather lack there of from the Chinese driver, that really got my Hong Kong friend’s ire), we made it to the district area where the restaurant is. The strange presence of an actual airplane in the parking lot threw me for a loop, but then I realized we were so close to Macau, which is trying to copy the tackiness of Las Vegas, so perhaps it was not entirely out of the question. Soon enough, the sight of large tanks of fish and other underwater creatures calmed down our mate after we were seated and instructed to go check out what was available. Other than in Thailand, I’ve never had the opportunity to go and select what I wanted to eat myself, and so I loved they had this system here. 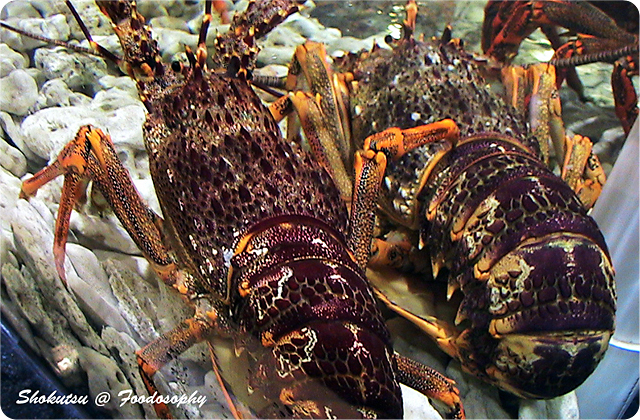 With all the choices though, it made for an interesting dilemma, but my eyes immediately locked onto the lobsters. If you’re the type who prefers straight ordering of a menu, then you might be out of your element here. This unfortunate pair that were huddle in the corner together, as if to avoid my gaze, were the innocent victims that I instructed our waiter to pluck out of the pool and serve to me. A little Lost in Translation took place as I was offered to select from a few styles of preparation, but I was able to finally persuade the man to see if the kitchen could just steam them. I wanted to avoid anything like a heavy sauce that would totally mask the flavor of the meat. This is what eventually came out, a little too “perfumed up” for my liking with the base sauce in the plate adding a distinct scent, and was contrary to my instructions of asking for a bare-bone treatment. But alas, it was not a total loss as the meat was succulent and rich with that definitive flavor that these crustaceans possess. As guilty as I felt for ordering these two to their untimely demise, I knew in the end that they had found a well appreciated home in my belly. 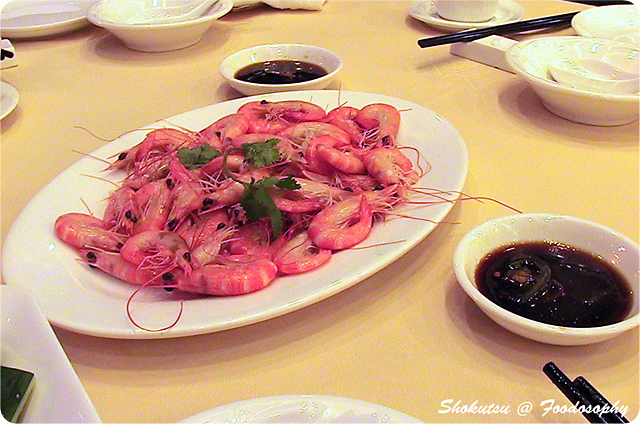 A platter of boiled shrimp with soy-based dipping sauces was the choice of my Hong Kong pal. De-shelling these tasty morsels was a bit of a hassle but they were so fresh and juicy that they were soon polished off. It was interesting netting these guys out of their tank, and probably the most combative opponent we had among our selections. 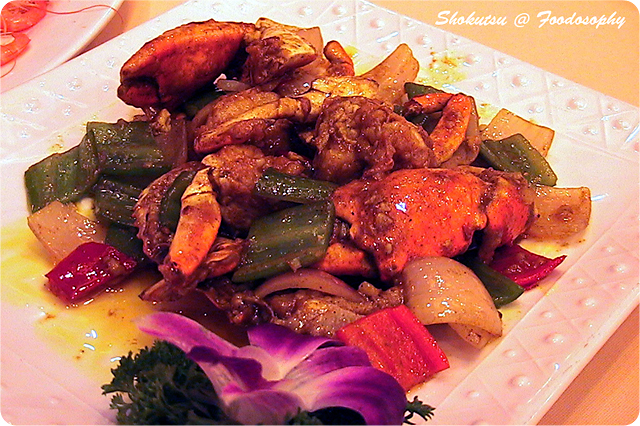 Crab claws stir-fried with assorted vegetables. I can’t say I enjoyed this dish as much as the others, just based on my personal preference for allowing the seafood ingredients to take centre stage, rather than the sauce in which it is cooked. 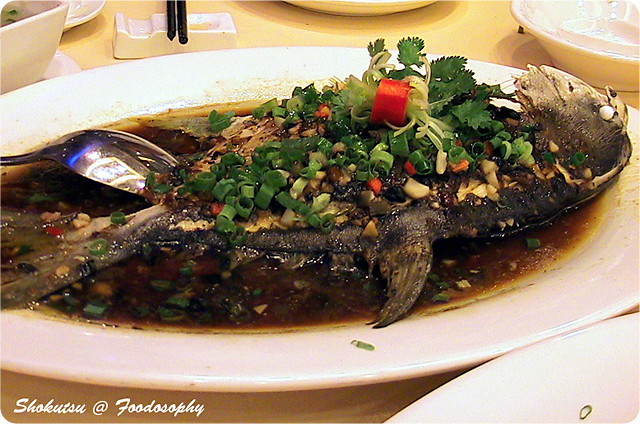 Steamed fish, provided its incredibly fresh, is always one of my favorite things to order in a seafood-specialty restaurant. The simplicity of it all just appeals to me. With a light soy/ginger-based broth giving it some added punch, the delicate white meat just fell from the bone structure without any deliberate picking. 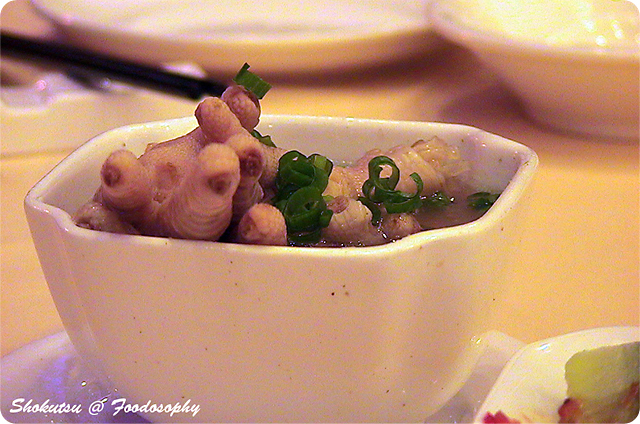 And lastly, a bowl of chicken feet. I must explain. Ordering this is a running gag with my friend and me. He knows I’ve never had it, and can’t stand the sight of it. 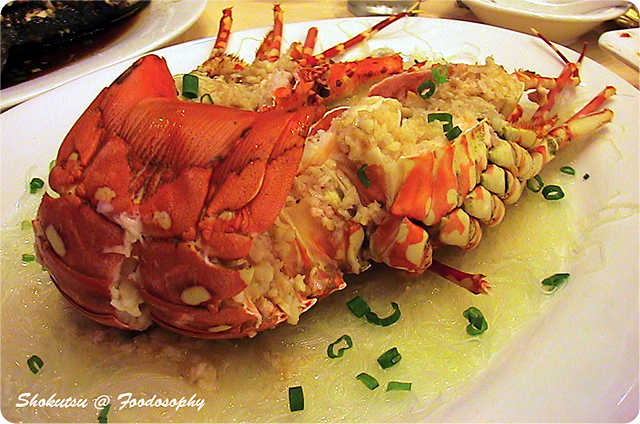 But nonetheless, he reveals in getting this brought to our table whenever I am in Hong Kong. Oh, the comedy! Through the course of this day, traveling through border crossings as if they were just neighborhoods in my own city, I learned one thing. There is never a barrier to finding great fresh food is you are willing to seek it out. You don’t need super powers to accomplish this, but just a mad crazy, change cheating Chinese cab driver to drop you off at the door.